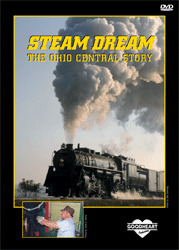 This program is the story of Jerry Jacobson and the Ohio Central Rail Road. In a video taped interview, Jerry explains how he developed an interest in trains at an early age and how that interest led to the Ohio Central of today. Includes steam action with many double headers, side by side running, a triple header, fall colors specials and winter charters. You'll want to watch this program over and over again.